Post the N-Gage era, the Razer Phone (first impressions) was arguably the first gaming-centric phone to make it to the market. 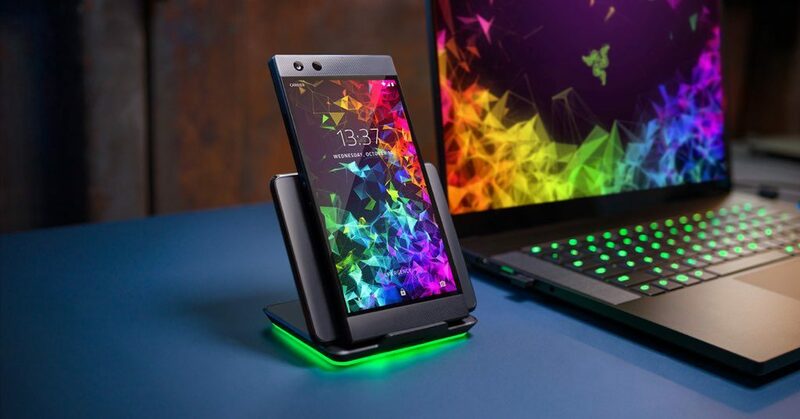 Considered that Razer is a well-known name when it comes to gaming equipment, it was an obvious move by the company as it aimed to make a mark with its gaming phone. Now, nearly a year after launching the Razer Phone, the company has launched its successor, aptly dubbed the Razer Phone 2. So let’s take a closer look and see what the all-new Razer Phone 2 brings to the table. On the design front, not much is changed. The Razer Phone 2 sports a boxy, no-nonsense look and twin front-firing speakers certified by Dolby Atmos. This time around the Razor Phone 2 has a Gorilla Glass back as opposed to the metal one on its predecessor. Other improvements include IP67 water and dust resistance, a feature that should cover accidental liquid immersions. However, the biggest change is the fact that the back of the device is now fitted with RGB lighting, which makes the phone quite attractive. The Razer Phone 2 comes equipped with a 5.7-inch QHD display with a 16:9 aspect ratio and a 120GHz refresh rate. It is worth noting that refresh rate is of prime importance when it comes to gaming, the higher the better. As far as display is concerned the improvements come in the form of increased brightness and an upgraded colour accuracy. The Razer Phone 2 features a dual-camera setup that consists of a 12-megapixel f/1.75 lens and 12-megapixel f/2.6 telephoto sensor. Since many users lamented the sub-par camera performance of its predecessor, the company claims that it has optimised the imaging unit in its latest offering. With optical image stabilisation, the snapper should help in improving the low-light performance and video stability. Other than that the camera app offers an array of features including portrait, and panorama. The phone can also capture FHD videos at a frame rate of 120fps. Needless to say, the hardware is the heart of any gaming device and the Razer Phone 2 is no different. The new gaming smartphone is powered by the Qualcomm Snapdragon 845 chipset, which is coupled with 8GB of RAM. Razer has also baked in the Ultramotion tech which is designed to reduce the lag and offer smoother visuals on the 120GHz display. The phone also has a Vapor Chamber Cooling which is expected to help in optimum thermal management. Thanks to the glass back, the Razer Phone 2 offers wireless charging. Moreover, the company has launched their very own wireless charging pod with lighting which will light up in specific conditions. With support for Qi wireless charging standard, the accessory will be able to juice up other compatible devices. The gaming major is offering the Cortex Mobile app with the Razer Phone 2. This app will host a set of games including popular titles like PUBG. According to the company, these gaming titles will get treated to performance profiles and optimisations from the developer. Another useful addition is the game booster software that will allow the users to tweak the frame rate, clock speed and advanced settings of individual games. If you are worried that you’ll need to hunt for the charger after winning just a couple of Chicken Dinners, fret not. The Razer Phone 2 comes fitted with a 4,000mAh battery, which should be able to deliver a good backup. And in case you do run out of juice, then the phone supports Qualcomm QuickCharge 4.0+ to charge quickly. The Razer Phone 2 will come with Nova Launcher slapped with Android 8.1 and Razer assures that it is working on an Android Pie update. The smartphone has been priced at $799 (~Rs 59,000) in the US, though it remains to be seen if it’ll be coming to the Indian market anytime soon.